Continuing a centuries-old Christian tradition, Queen Elizabeth II celebrated Holy Thursday by handing out coins in St George’s Chapel at Windsor Castle during the annual Royal Maundy service. 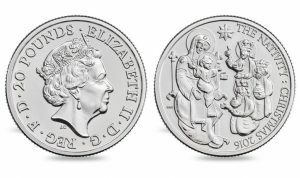 The Royal Mint produced the United Kingdom’s first official Christmas coin, which is now being sold at face value. 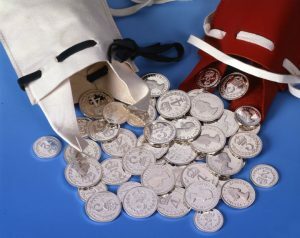 Queen Elizabeth II celebrated Holy Thursday by handing out Maundy money in a ceremony held at St George’s Chapel at Windsor Castle, continuing a centuries-old Christian tradition and marking the first time the Royal Maundy Service was held there since 1959. Today, celebrating Holy Thursday also known as Maundy Thursday, an annual tradition continued as Queen Elizabeth II handed purses of coins to 178 pensioners. 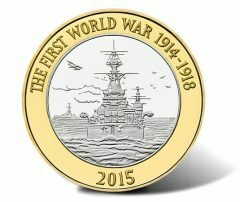 Honoring the Royal Navy’s role in World War I, the Royal Mint released into circulation a small number of £2 commemorative coins. 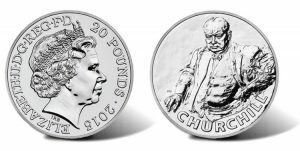 British statesman Sir Winston Churchill, one of the legendary wartime leaders of the 20th century, is featured on the Royal Mint’s third £20 silver coin that sells at face value. 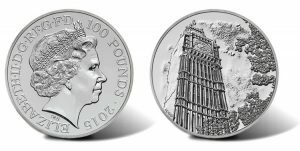 Big Ben, London’s iconic clock tower which stands at the north end of the Palace of Westminster, is featured on the Royal Mint’s first ever £100 silver coin that sells at face value. Continuing a Christian tradition that dates back centuries, Queen Elizabeth II marked Holy Thursday today, April 17, 2014, by handing out Maundy money during a ceremony held at Blackburn Cathedral in Lancashire, England. 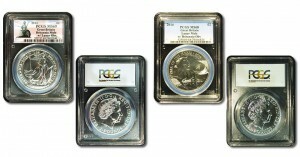 Varieties of bullion 2014 £2 Britannia and 2014 £2 Lunar Year of the Horse mule error coins have been authenticated, graded and certified by the Paris Submission Center of Professional Coin Grading Service.